"Let's it snow, Let it snow, Let it snow!" 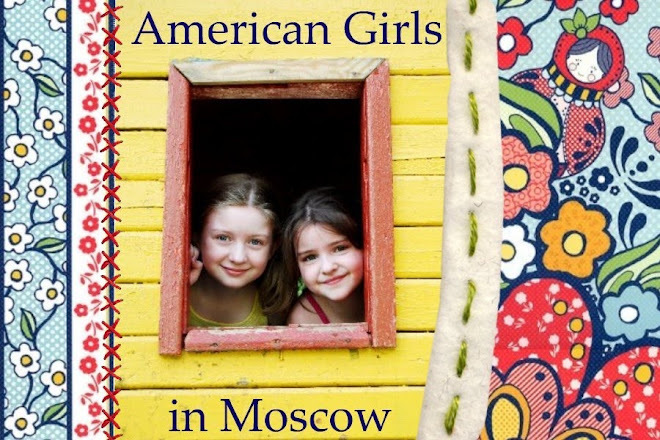 I wrote about the history of pukh in Moscow back in 2008... To briefly recap, though, here's the gist: "Ah, the joys of unfertilized dogwood pollen... All because of an idiotic horticultural decision made by Stalin in 1934. Poplar trees have to be planted in equal male/female varieties; Stalin, alas, only had eyes for the ladies... And thus, our sexually frustrated poplar trees blow out their pollen in mass unfertilized snow-like clouds, wreaking havoc on all those who suffer from allergies or who don't particularly enjoy having fuzz stick to their tongues, eyes and land in their coffee." Something else I've learned? 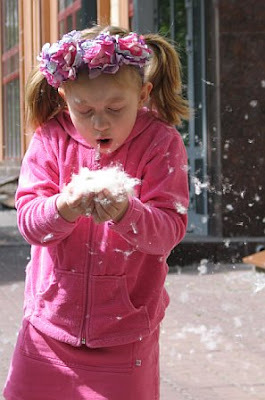 Don't put on lip gloss before walking into a snowstorm of pukh, or you'll end up with lips covered in white fuzz. It's actually quite funny once you get over being grossed out! This is what the tufts look like up-close. The girls both love it... Back in 2005, our first time experiencing the joys of pukh season, they thought it was actually snowing... 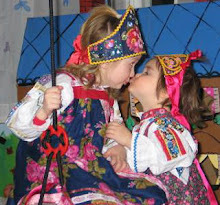 These pictures of the girls were taken in 2006, when Katya was five and Natalia was three. *I'm severely allergic to pukh and I've been pretty sick, despite preemptively taking Claritin this year. Feeling Pretty Crummy + No Internet At Home For Ten Days = No Blogging For The Past Two Weeks. WOW ~ I really thought this was snow before I got to the part where you told what it Really was. Unbelievable! I am so sorry!! I'd be dying with my allergies. You need to keep on the Clariton year 'round like my doctor has me on. It really does look like snow. Wish the clock would turn back and the girls weren't growing up so quickly. In the first picture, the tree on the right looks like a Charlie Brown Xmas tree. This year seems MUCH worse than the two years I was there. I never saw it blanket the ground . . . only large piles in the gutters. The problem with burning it is that other things catch fire. I heard tell of people tossing cigarettes on the street, the pukh catching fire, and then a car catching fire because the pukh was under it . . . I have never seen anything like that. May be it is much worse in Moscow than in Leningrad. May be it is just a crazy year. I always suffered badly in the pukh season, I would probably just die in the one you are having this year. Really like the picture of Christmas in June. All picture looks good but the last one with a cutie is my fav. does not sound like a good time! you'll be in the states soon enough! safe travels this summer. We have the same problem this time of year in Wisconsin-- I think our cottonwoods at least share the same genus as the Russian poplars. Some years are worse than others for pollen, but I don't think anyone here has been as enthusiastic about this messy tree as Stalin apparently was.